Cardhu, Glenfiddich, Glenlivet, Glenmorangie, Lagavulin, Macallan… all these great Scotch names capture the mind of any pure malt whisky lover. 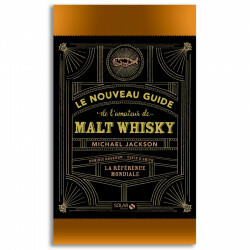 Discover all the secrets of the world of whiskies, by Michael Jackson. They are here gathered for you (with more than 330 brands and labels) in this unique whisky guide. Famous whisky expert Michael Jackson makes the most of his knowledge to rank each of them from 50 to 100, and marks each and every whisky distillery label.